Is heartburn actually CAUSED by too much acid? Is decreasing acid production a good idea? What happens in the long term if acid is continually decreased? 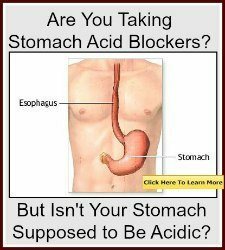 Isn't our stomach SUPPOSED to have a high amount of acid? While doctors don't seem to think that these are important or even interesting questions because Omeprazole Side Effects and Lansoprazole side effects seem rare and non-problematic, it's VERY possible that the side effects of Omeprazole just occur over such a long period of time that your doctor doesn't notice- but rest assured that, in time, YOU will notice. Only you may not recognize them as side effects of Omeprazole either, so brainwashed are we to believing that chronic health problems are simply a natural part of getting older, but what if chronic health problems are, in many cases, simply drug side effects?! Omeprazole side effects and Lansoprazole side effects can be EXTREMELY serious. These drugs were NEVER intended to be used longer than a few months, yet they are being used for YEARS and sometimes even decades. However, reports are starting to come out that there truly are problems with taking these drugs long term and that maybe reducing acid isn't such a good idea after all. Some of the more serious problems are highlighted below. Next to breast cancer, probably one of the most feared health problems for a woman is osteoporosis. Osteoporosis seems to be so random, striking women who always believed that they wouldn't get it. But what is coming to the forefront now is that Omeprazole side effects can lead to Low Calcium Levels and Magnesium Deficiency, both of which can lead to osteoporosis. Our stomach is DESIGNED to be acidic, and it's well known that calcium is best absorbed in the presence of acid. That's why they fortify orange juice with calcium and why calcium in the store is often in the form of calcium citrate. The 'citrate' is citric acid- the same stuff that's in orange juice- and helps you to absorb the calcium. Calcium, however, is overrated as a 'bone builder' and it is magnesium, Vitamin D, and Vitamin K that help to build bones as much, if not more so than calcium. Interestingly, side effects of Omeprazole have led to such severe Magnesium Depletion that there have been cases of people having seizures from low magnesium that were directly related to the use of prescription antacids! Yipes! Seizures and osteoporosis as Lansoprazole side effects! There are many researchers who believe that Signs of Magnesium Deficiency are epidemic. However, most of these symptoms being misdiagnosed as chronic health problems like depression, migraines, heart disease, and chronic back pain. Could the use of these prescription antacids be contributing to the epidemic of these magnesium deficiency health problems in the US? Even worse is that newer research has shown that one extremely serious problem is that PPI's Give Users a 16% Increase in Heart Disease over non-users. This is probably due to the fact that nitric oxide, a potent protector of the heart, requires an acidic stomach in order to be absorbed. Any doctor who is giving their patients a drug like Omeprazole, that increases their risk of heart disease, while giving them a Statin Drug, ostensibly to decrease their risk of heart disease, is acting completely contradictory. Yet this is almost standard practice. Additionally, many doctors will tell their patients to use an Antibacterial Mouthwash to help prevent gum disease, which can lead to heart disease. But in doing so, they are wiping out the nitric oxide that protects the heart! So, taking Omeprazole and using an antibacterial like Chlorhexidine Mouthwash is a sure-fire way to get to an early grave. Omeprazole side effects also can cause Vitamin B12 Malabsorption, causing a condition called Hyperhomocysteinemia that is a risk factor for Mental Changes from Vitamin B12 Deficiency. Even a 7 day course of PPI's was shown to create measurable cognitive decline; longer courses have been shown to lead to deposition of a substance in the brain called 'Amyloid Beta', which can Cause Alzheimer's Disease. Stomach acid is designed to do more than just help you to digest food and absorb nutrients. Every single time that you eat or drink, you are taking HORDES of bacteria into your body, and your stomach acid is the first line defense to kill these pathogens. While most people are constantly worried about washing their hands to avoid getting sick, these same people would have no qualms against taking a prescription antacid and unknowingly allowing all sorts of pathogens to take up residence in the digestive tract! These Antacid Medications can Ruin Your Gut, and a problem called C Difficile Infection is the most well studied intestinal infection that Omeprazole Side Effects, as well as Quinolone Antibiotics, can contribute to. This is a serious problem because C diff is not a 'garden variety' infection, but it can contribute to lifelong suffering, surgeries to remove the colon, and even death. You might think that this is all well and good that Omeprazole Side Effects can lead to serious health problems, but what alternative do you have? If you have acid reflux, you may THINK that there is no other solution to that terrible acid feeling, but there are solutions. First of all, if you have heartburn or reflex and have not been tested for the H Pylori Bacteria that lives in your stomach, this is the first thing that should be done. H Pylori infects half the world, and is a known cause of heartburn and reflux. There are any number of health consequences for having H Pylori long-term without treatment. Secondly, and most surprisingly, the sensation of Too Much Stomach Acid is nearly always due to too LITTLE acid instead!! While it's counterintuitive, it's true in many cases, and the answer is not to DECREASE stomach acid, but to INCREASE it!! Stomach acid levels are highest when we are children and decrease throughout life. If too much stomach acid is really the problem, then children would be the ones always complaining of heartburn, and the elderly would almost never have it! You can find out if this is true and solve the problem at the same time by taking the Hydrochloric Acid Deficiency Test to see if that improves your symptoms. I urge you to give it a try if you have heartburn or an 'acid stomach'.